With Valentine’s Day just around the corner, we’re ready to indulge in some delicious chocolate – whether loved up or not. And this time you can feel guilt free by gorging on the right kind of chocolate. Science even says so. Joshua Gaudry, Food Scientist at Flannerys Organic and Wholefood Market suggests to, “opt for dark chocolate instead of milk chocolate, especially the ones with high cocoa solid content, anything around 70 per cent and above is perfect, as it offers more health benefits than its counterpart due to containing more antioxidants and being lower in sugar”. Scientific studies have shown that dark chocolate, which is also low GI, has the feel-good factor due to mood-elevating chemicals, including tryptophan, tyrosine, caffeine, epicatechin and theobromine. In other words – CHOCOLATE IS GOOD FOR YOU! Of course in moderation, but nonetheless the moorish, glossy block of brown stuff has health benefits. 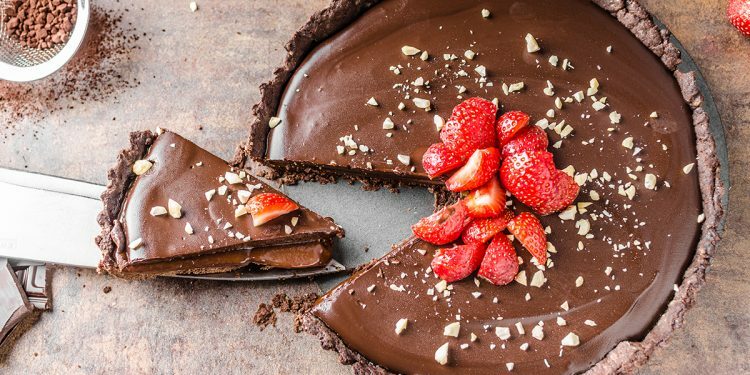 To celebrate the fabulous news and of course Valentine’s Day, Flannery’s Organic and Wholefood Market have shared some of their choctastic recipes with us. The perfect solution for your last minute, homemade and delicious Valentine’s Day gift! Have a sweet tooth? 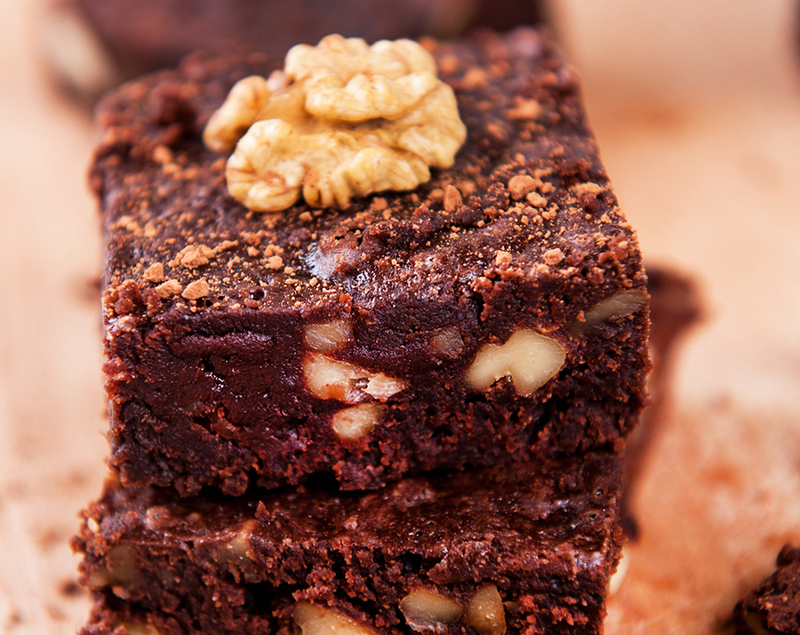 Enjoy these raw brownies guilt free! Packed with antioxidants from raw cacao, plenty of fibre from dates plus omega-3 fats from walnuts – they’re a healthy treat alternative (gluten free, vegan, raw) you won’t be able to put down! Transfer to a large bowl and add the roughly chopped walnuts. 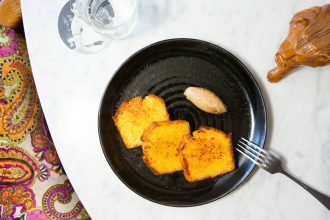 Press into a lined baking tin and refrigerate or freeze until ready to serve. Sprinkle with extra cacao powder lightly then enjoy! 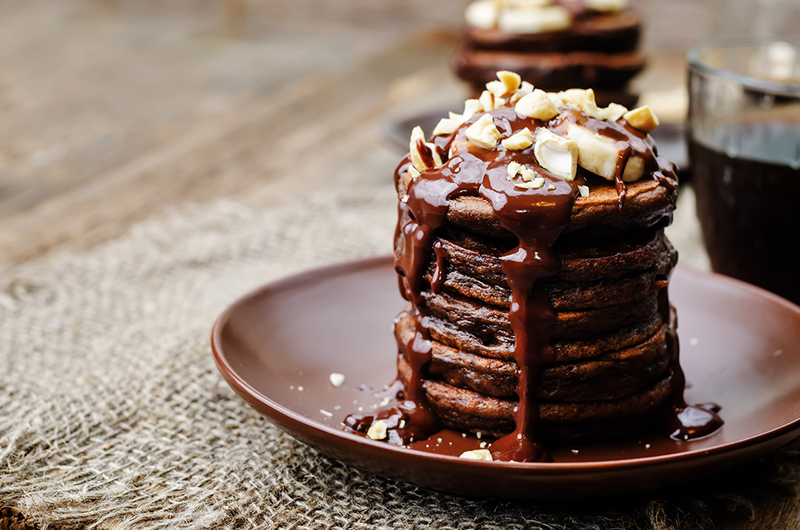 Light & fluffy Choc Protein Pancakes for a healthy start to the day. Add a sprinkle of Flannerys Organic & Wholefood Market’s favourite nuts and a spoonful of their Peanut Cacao Spread as a delicious topping. In a food processor, add all the ingredients and blend until smooth. In a fry pan over medium heat add a little coconut oil and once melted add around 1/4 cup of the pancake mixture. Cook until the mixture starts to bubble and then carefully flip. Fry for a further 2 minutes, remove from the pan and transfer to an oven safe dish to keep warm whilst cooking remaining mixture. Add a sprinkle of your favourite nuts and a spoonful of our Peanut Cacao Spread as a delicious topping. 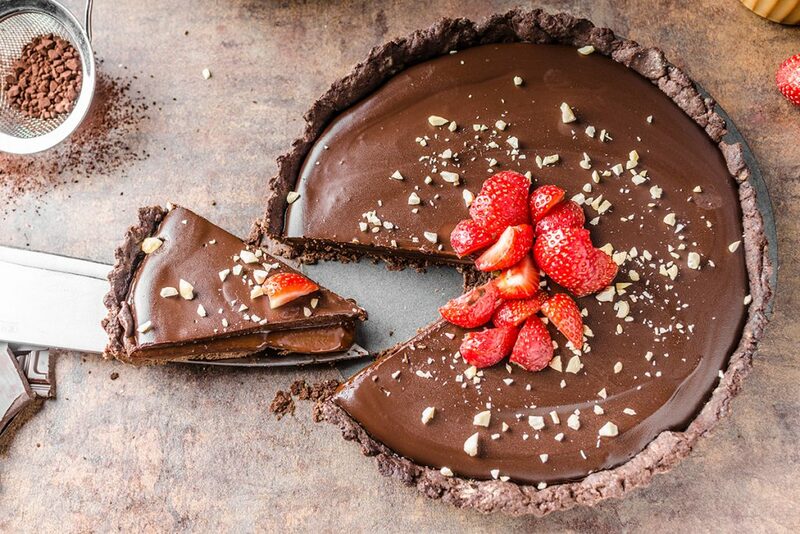 Now the pièce de résistance – This delicious Vegan Chocolate and Salted Caramel Tart ticks all the taste bud boxes! If you have pre-made shortcrust pastry, feel free to use that as the base; otherwise, Flannery’s have provided a fuss-free pastry recipe as well. Top with your favourite nuts and fresh strawberries and dive in for a delicious treat! It’s gluten free and vegan. Preheat oven to 180 degrees. Lightly grease a 22cm tart tin. Whisk flour, cacao and salt in a large bowl until combined. Add coconut oil in spoonful’s and use a fork to combine ingredients until it resembles crumbly wet sand. Add ice cold water 1 tbsp at a time, using enough to help it form a dough. Knead gently with your hands in the bowl, then transfer to a lightly floured surface. Form a dough ball, then, place and flatten between 2 sheets of baking paper. Using a rolling pin, roll out the base to roughly 3mm thick. Take the top baking paper off, then flip and drape over the tart tin gently. Remove the other sheet of baking paper, then use your fingertips to fill in any gaps. Bake for 10-20 minutes or until lightly browned. Remove and let cool. Blitz dates, coconut oil and vanilla until a thick paste. Add cream and salt, and blend again until smooth, scraping down the sides to get all mixture. Spread over the pastry base and freeze for 20-30 minutes. In a heatproof bowl over simmering water, melt coconut oil, agave syrup and vanilla. Stir, then add cacao, whisk until smooth. Pour over the caramel filling, spread with a spatula. Place in freezer for 10 minutes, then serve sprinkled with crushed nuts and strawberries.